From outsider and misfit to running one of the world’s most successful websites for women, Jennifer Romolini offers a frank, funny and thoroughly original take on how to get and keep the job you want. A former dropout and ‘failure’, Romolini knows better than most how to keep your sense of humour and sense of self as you climb the ladder, tackling sexism and trolls, self-consciousness, insecurity and self-doubt on the road to success. Romolini has built a remarkable career speaking to women. Starting out as an awkward twenty-something, she navigated her way through New York media and became a boss – editor-in-chief, editorial director and vice president – all within little more than a decade. In Weird In A World That’s Not, she asserts that being outside-the-norm and achieving real, high-level success are not mutually exclusive, even if the perception of the business world often seems otherwise and it appears only office-politicking extroverts are set up for reward. 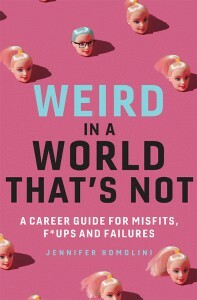 Part career memoir, part real-world guide, Weird in a World That’s Not offers relatable advice on how to achieve your dreams, even when the odds seem stacked against you. Romolini helps you face down your fears, find a career that’s right for you, and get and keep a job. She tackles practical issues and offers empathetic, clear-cut answers to important questions like how to navigate the awkwardness of networking, office politics, how to be a boss not just a #boss. And, most importantly: How do I do all this and stay true to who I really am? Authentic, funny, and moving, this book will help you tap into your inner tenacity and find your path, no matter how offbeat you are.